Drawn in 1877 by Jean Charles Adolphe Alphand, this landscape garden is an oasis of verdure in the town. Where very prized by people of the town, estate reserved to swan with his ornamental lake, the small public garden Vermenouze renowned for his gardener's art in the mosaic. It still exudes poetry that Arsène Vermenouze told in this time. 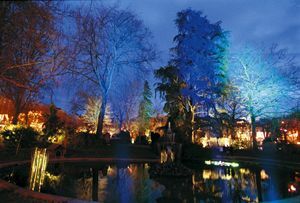 Stagecraft approach of the lighting allow visitors to appreciate night and day, over the seasons, his Cedrus Bleu and his gioant Sequoia in Matador's costume.